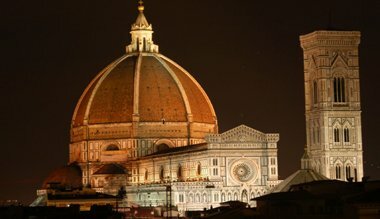 Welcome to Travel-To-Florence.com. Your online guide to the greatest sights in history! 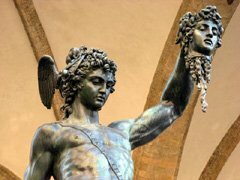 This website is dedicated to the sights, sounds and magic that is Firenze. Resting in the lap of the Tuscany region, this center of art is situated with Milan at its north and Rome at its south. Florence Italy is a magical place and absolute heaven for art lovers and tourists alike! Florence is much more than a tourist destination; it is a divine spot, one of the few historically rich and vivid locations on Earth that speaks out to you in a resonant voice about its magnificence. But before you go, it is important to know all the amazing things that Florence Italy has to offer and how to find them, that's where we come in. The best attractions, piazzas, museums, restaurants, cooking classes etc! * Piazzas: The Piazzas give you an amazing insight into the life, passions and beauty of Florentine life. The Piazza della Signoria is undoubtedly the most beautiful square in the city (if not the world) and is still important as the Florentine's social and political centre. The Piazzale Michelangelo provides wide views of the Duomo, Ponte Vecchio, the Uffizi, and the Bargelo. Guilo Parigi offered the city the piazza of Santa Croce, and he also worked as the architect of the Pitti Palace for the Medici family. * Museums: The Florence Archaeological Museum contains impressive collections of Egyptian and Etruscan Art. The Uffizi gallery is the showplace of many renaissance paintings by such famous artists as Botticelli, Raphael and Michelangelo. The Pitti Palace also houses an incomparable art collection featuring paintings by Caravaggio, Titian and Rubens. The adjoining Boboli gardens are a wonderful place to have a picnic or spend a lazy afternoon. * Hotels: No matter what time of the year you prefer to visit Florence Italy, there are a number of hotels, apartments and villas available in all price ranges. From one star hotels to five star villas there is something for everyone in Florence! The key is to reserve the required number of rooms as early as possible. The same advice goes for villas and apartment rentals. July and August are the busiest months and the prices are higher. You can avoid the bustling crowd by visiting in late April and May or September and October. The weather is perfect in these months and the crowds are much smaller. * Restaurants: The restaurants in Florence Italy provide absolutely heavenly feasts. They offer you the freshest ingredients prepared with age old techniques that leave your gastronomic tastes satisfied! You can also try your hand at creating your own recipes in your apartment rental or villa after buying the freshest of ingredients in the local markets. * Weather: Tuscany is situated in the inland regions of the Mediterranean, and so it is considerably more humid than the coastal regions where the winds blow. Florence experiences a subtropical climate, and is neither too hot, nor too cold. Florence is truly a rich experience for all senses, and you will certainly enjoy yourself under the Tuscan sun!